For more than nine decades baseball fans have been attending Boston Red Sox games at Fenway Park. However many may not know that the ballpark has been the home of three professional football franchises. Fenway Park was built in 1912 because owner of the Red Sox, John Taylor, wanted a new ballpark for his team. In April 1912, the ballpark was completed and named Fenway Park because of its location in “The Fens” in Boston. The 27,000 seat ballpark was home of the Red Sox until the Boston Redskins moved to the ballpark in 1933. In July 1932, George Marshall was awarded the Boston football franchise. During their inaugural first season in 1932 the team was named the Boston Braves because they played at Braves Field. After the 1932 season the Braves were moved to Fenway Park and renamed the Redskins. The team played their first game at Fenway Park in September 1933 against the New York Giants. The Redskins played four seasons at Fenway Park before moving to Washington after the 1936 because of low fan support. Eight years after the Redskins moved to Washington, the Boston Yanks began playing at Fenway Park. The Yanks played their first game at the ballpark in September 1944 against the Philadelphia Eagles. Because of several losing season and financial problems, the Yanks folded after the 1948 season. The last professional football team to play at Fenway Park was the Boston Patriots. For six seasons the Patriots played at Fenway Park. They played their last game at the ballpark in a win against the Cincinnati Bengals in 1968 moving to Foxboro Stadium the next year. 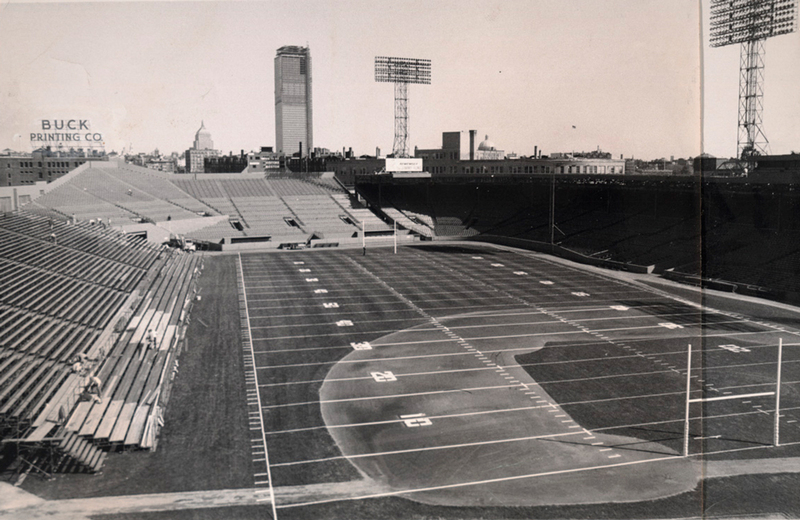 The setup for football games at Fenway Park was relatively simple. The gridiron was laid out over the baseball infield and into right field. Bleachers were set up in what was left field during baseball games. The Red Sox have continued to played at Fenway Park since 1968. Although the ballpark has grown in capacity it still looks similar as when it opened. Today, Fenway Park has a seating capacity of 38,805. The prominent feature today at Fenway Park remains the Green Monster, a 37 foot high wall in left field. Throughout the late 1990s there were discussions of a new ballpark being built for the Red Sox. However, the current owners of the team are committed to keeping the team at Fenway Park.